Hello! A year ago today I did THIS fashion post, and I'm back with the same shirt, but styled with different pants. Ironically, I didn't plan it this way. 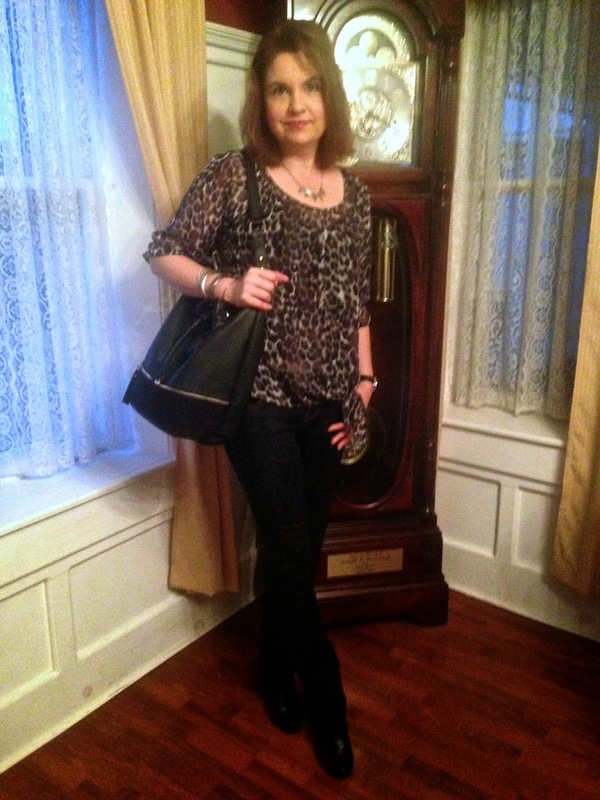 I was just looking for my old post so I could show you how I've worn this blouse before, when I realized it was exactly one year ago. 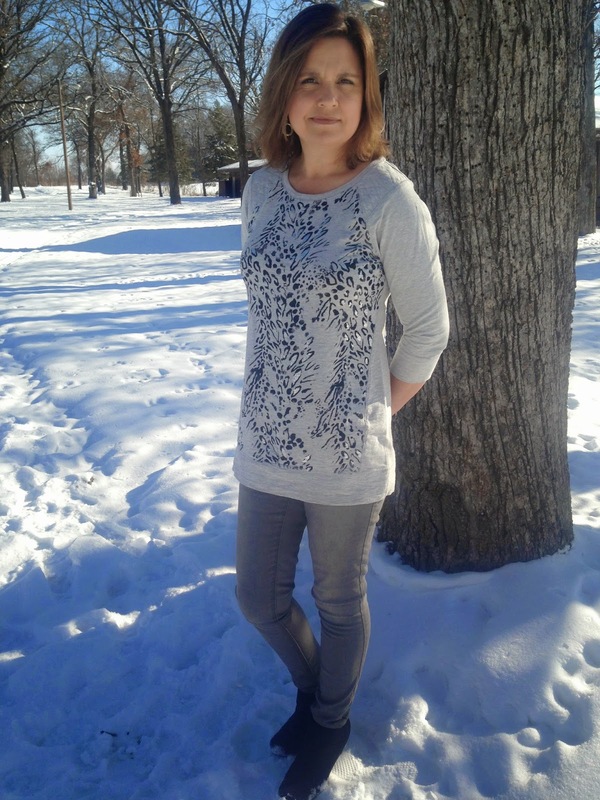 I think one of the nice things about classic prints like the one in this blouse, is that they are timeless and seem to never go out of style. 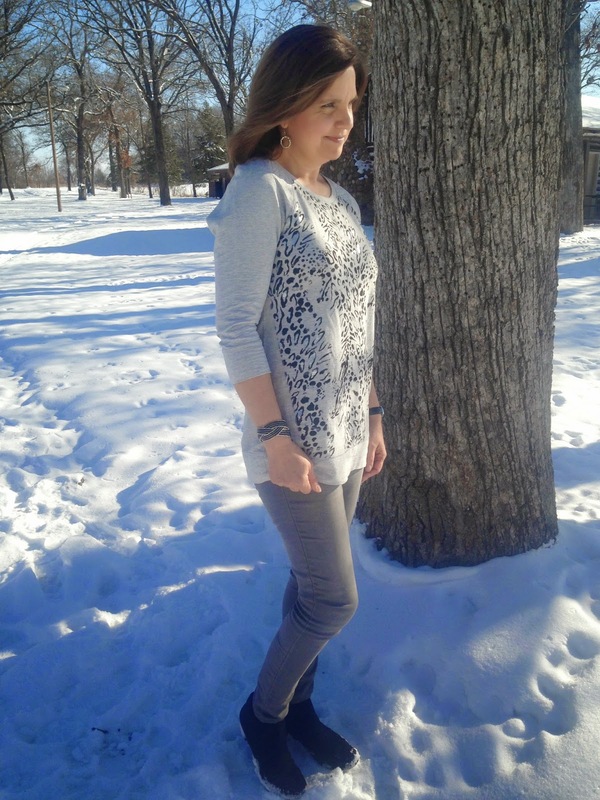 Actually, I think animal prints are hotter this year than they were last year, and it will probably be another full season before they start to wane in popularity. 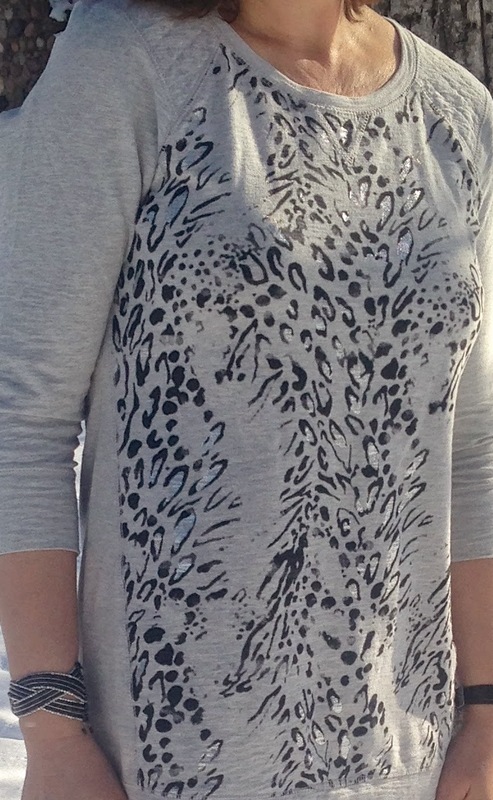 But the print itself, will always be fashionable, so you can never go wrong investing in leopard. I bought this blouse at Express last year. I really like how loose and blousey it is because it camouflages my midsection. It ties just below the hip, and it is very sheer so you must wear a camisole underneath. 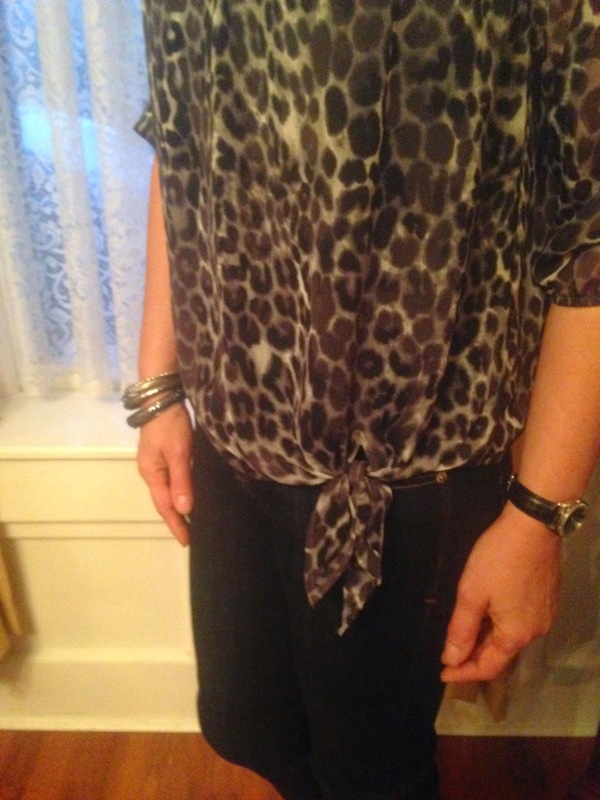 Last year I wore this blouse with tan dress pants, this year I had dark denim jeans on with black booties. I apologize for my photos. I'm back to taking pictures inside my house because of the weather, and it was still dark outside when the morning the pictures were taken so the lighting is terrible. I also used my IPhone instead of my DSLR camera, and that didn't help. 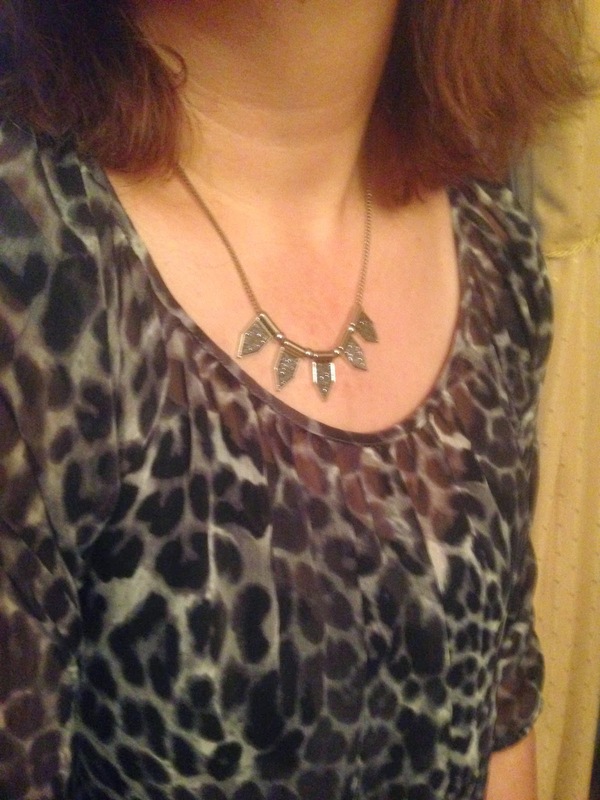 For jewelry, I have a new necklace from Express that I just bought. I've noticed that jewelry styles are starting to change again from big and bold to more dainty, so I've been trying to buy new pieces when I see something I like. I really liked how edgy this necklace looked, and I felt it would help balance my more traditional outfits a bit more if I wore a more trendy piece of jewelry with them. If you are afraid of wearing edgy or trendy items, just try them in small doses like one piece with more classic items. It updates your look without making you feel self conscious. Here is the tie of the shirt at the hip line. Such a cute added touch. 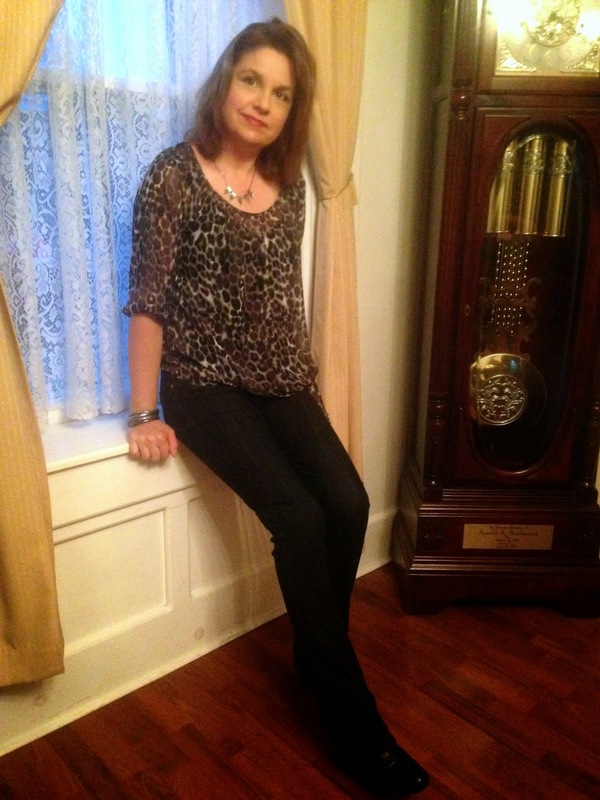 My other jewelry were some old silver bangles and a black and silver watch. Hello! 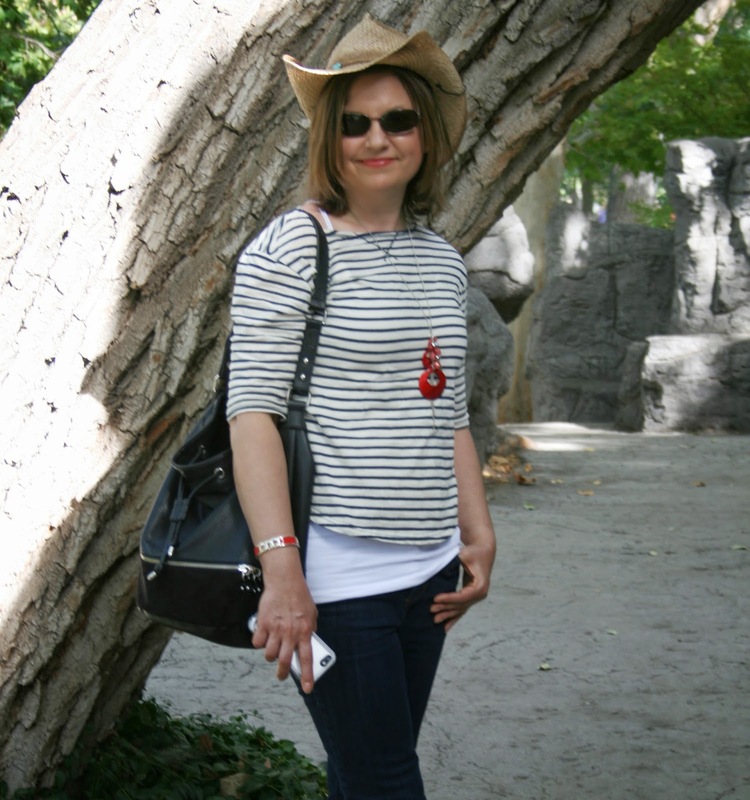 This week's travel post is for all the animal lovers because it's about our visit to the Albuquerque Zoo. 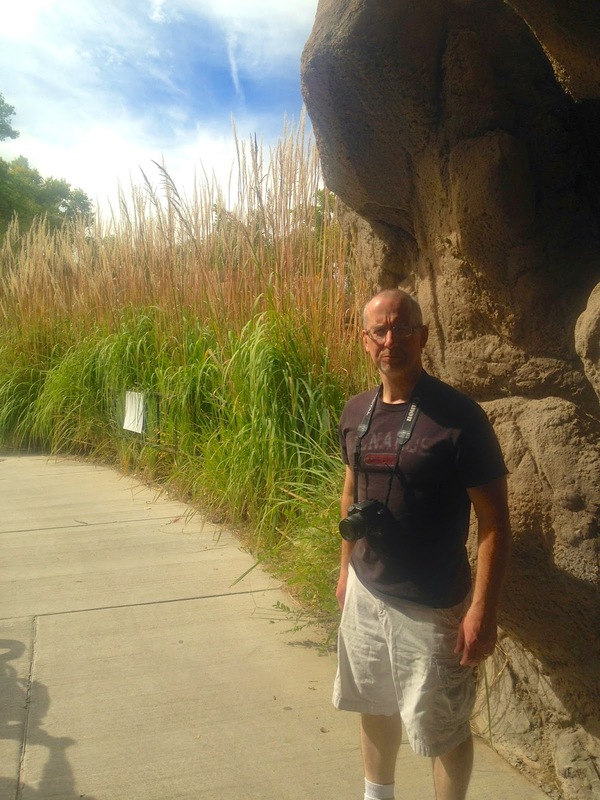 After we spent the morning of Day Five on top of the Sandia Mountains, we drove to downtown Albuquerque to meet our son-in- law Jason at the zoo. Our family loves zoos, especially our son, so whenever we visit a new city, if we have the time, we always try to make a stop to the zoo. Unfortunately, our son was not with us on this trip because he was away at school, and as much as I enjoyed our visit to this zoo, the whole time I was there I experienced a sort of sadness because all I could think about was how much my son would enjoy this zoo. I longed to 'beam' him from Minnesota to New Mexico, just so he could experience the zoo with us; but of course, I could not. So with the help of modern technology I took lots of pictures and videos and sent them to him. But then, that ended up making it worse, because the second he got the pictures he called and said 'I can't believe your at a zoo without me!' Oh well, I tried. 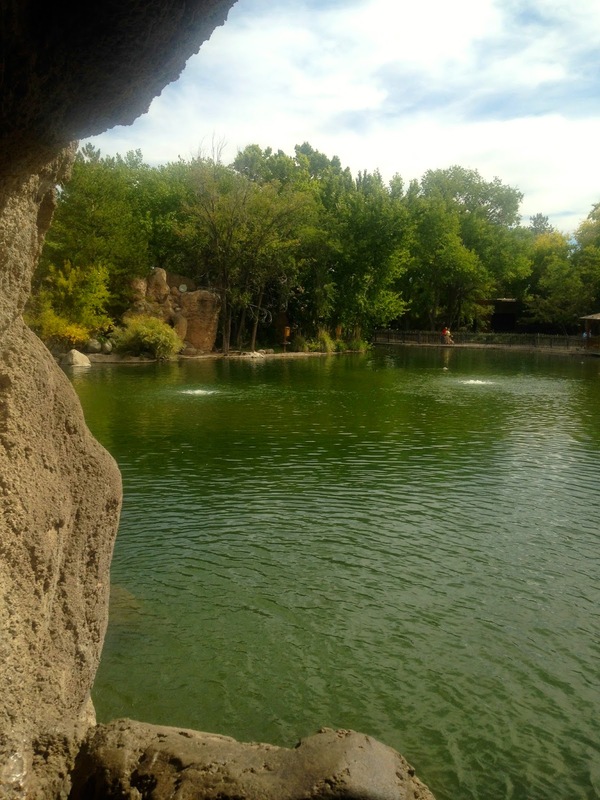 The Albuquerque Zoo is actually part of what they call The Albuquerque Biological Park. 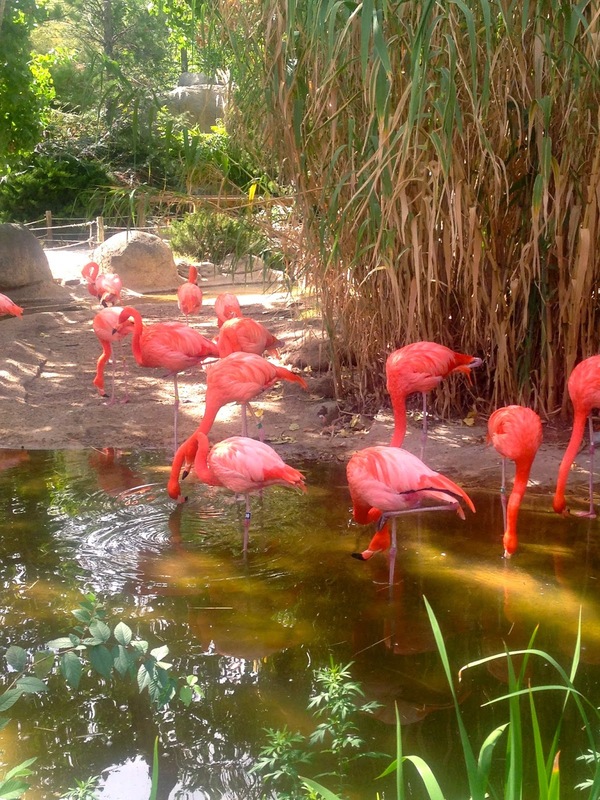 This park consists of the zoo, an aquarium, and botanical gardens. We had planned on seeing all three but when we got there at noon the cashier said that we would never have time to see everything before it closed, so we just saw the zoo. And she was right. The zoo ended up being so huge that it is was dusk and growing cold by the time we were done. I was very disappointed, because I really wanted to see what botanical gardens would be like in the west, and the aquarium also looked amazing, but, time just wasn't on our side that day. Oh well, if I ever get back to Albuquerque…..yeah, right! We will probably never see New Mexico again, unless I can convince my husband to retire there! 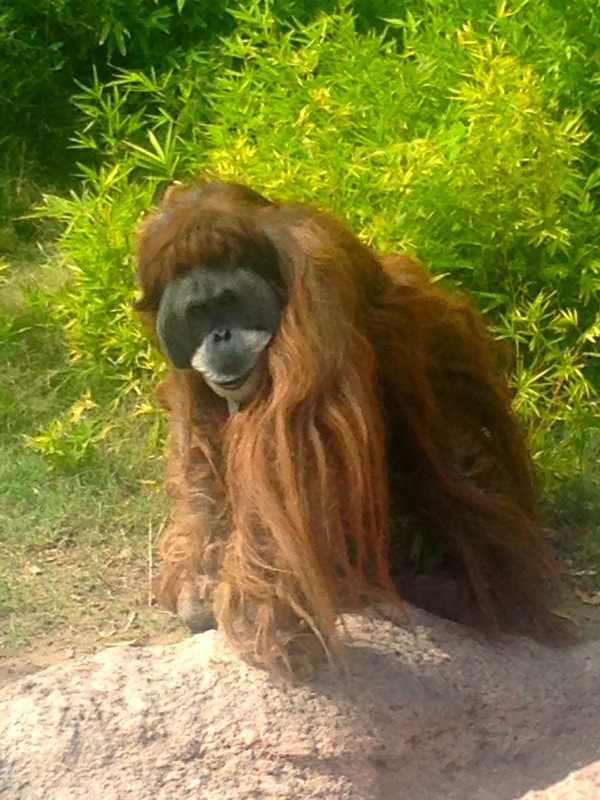 The cost to just see the zoo for a non-resident was only $12.00 for an adult ticket and parking was free. I thought that was very reasonable compared to most zoos I have been to. If you wanted to see all three parks, it would have been $20.00 per person. The very first thing we saw when we walked through the gate was this lovely pond surrounded by bamboo and filled with beautiful flamingos and ducks. I squealed with delight the minute I saw these lovely birds. Just look at the color! The only time I've ever seen flamingos before was at the Milwaukee Zoo, but they were always far in the distance, and this was the first time I ever got this close to them. What a breath taking sight! This little guy was sitting right next to my feet when I was taking pictures of the flamingo's. 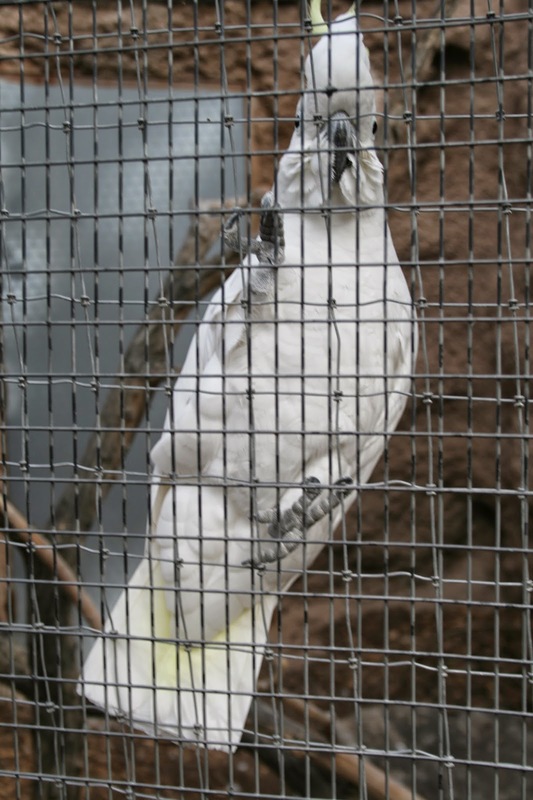 They had lots of birds at the zoo, including an aviary section where you could walk into and experience the birds up close. This cockatoo was so friendly and flew right up to us and started to say 'Hi!' He absolutely loved attention from people and wanted to interact with everyone who walked by. There were several ponds on the zoo grounds and they were all filled with beautiful koi. The water seals and otters were all swimming in the water when we there, but they had an upper observation deck for when they are sunbathing on the rocks, and a lower path with windows to see the animals when they were under the water, so we got to see them very close every time they swam past the window. Of course no zoo is complete without peacocks. Our favorite part of our visit to the Springfield Zoo a couple of years ago were the peacocks. They were so entertaining, as well as lovely to look at, and the peacocks at this zoo did not disappoint either. Such beautiful creatures they are, and such fun personalities they have! 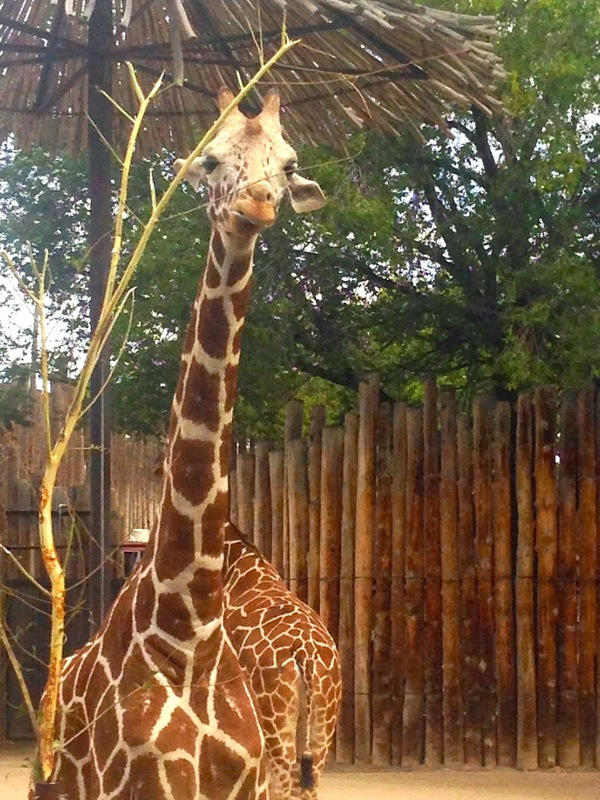 There were two things I loved about the Albuquerque Zoo: Number one, was how close we could get to the animals. I have never experienced a zoo that brought us so close to them before. Most zoos have big divides or ravines, so the animals are quite a distance away. But not this one. The second thing I loved about this zoo were the grounds. They were absolutely gorgeous and well maintained. They had lovely flowers, adobe styled buildings, and many gorgeous tree lined paths. Below is a picture of me standing next to a fall ginkgo tree. 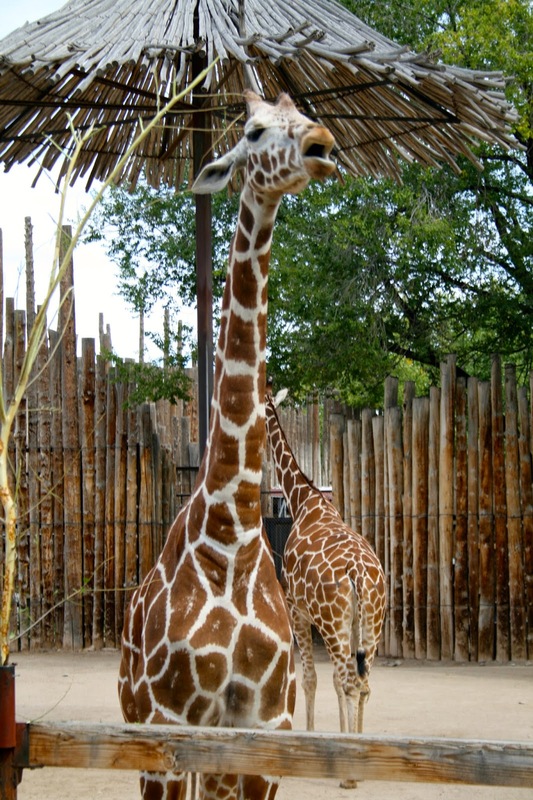 We could get really close to the giraffes because they had an upper level ramp where the animals would come and feed. We couldn't reach out and touch them like we did at the Springfield Zoo, but we were able to get some amazing photos because we were so close. Zebras always amaze me. Every time I see this stunning animal, I think how creative God must be. It's ironic in a way, because stripes or even the color combo black and white is perceived as a 'modern' style today, and yet thousands of years ago, God had already created it and put it on an animal. Did you know that no zebra has the same pattern of stripes? Amazing isn't it? Look at the muscle on this animal. What strength and power! The differences of animals in creation is such an interesting thought. Some are shy, some are graceful, some are fragile, some are playful, some are mischievous, and some, like this guy, are just brute strength. It's like they all have some small aspect of human personalities and traits. Speaking of personality, this guy came out to visit me when I was looking at some baby monkeys playing in the distance. I had my camera focused on the babies, and never noticed him appear out of the bushes. He was literally only a few feet away from me. He just stopped, sat down, and interacted with me for quite awhile before he finally walked away. What a joy! 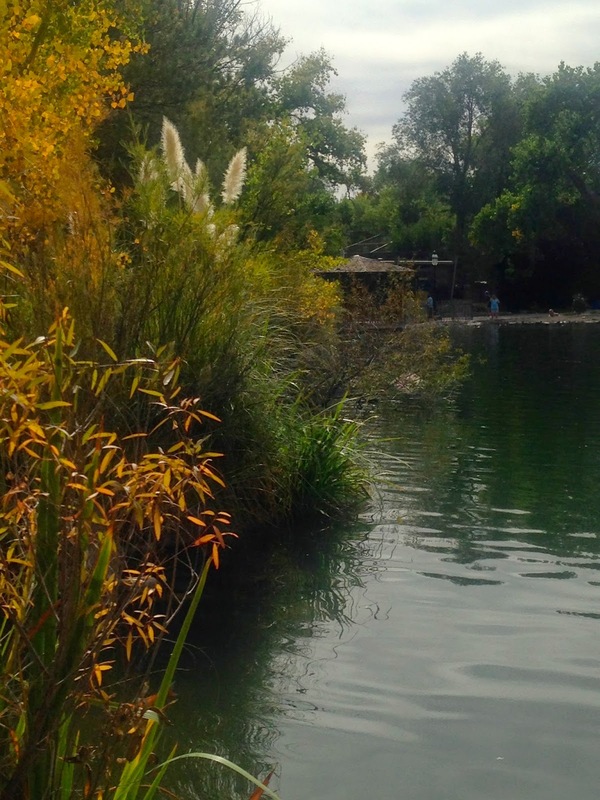 Here is one of the ponds on the zoo property with all the gorgeous fall colored grasses and trees in the foreground. We got this view looking through an man-made rock window from a path we were walking on. As you exit this path, you come across this opening where these magnificent, tall, blooming grasses bask in the sun. I had my husband stop and turn around so I could take a picture with someone in it to give you all a perspective of the height of these grasses. My husband is five feet nine inches tall, and these grasses are well above his head! The hippopotamus viewing area was one of our favorite spots in this zoo. As I said repeatedly already, we were amazed at how close we could get to the animals, and this one was no exception. This guy entertained us for quite awhile by going in and out of the water, then suddenly popping up his head out of the water chewing seaweed or whatever, and then coming back out again to lumber around on his private beach. So often when you visit zoos, the animals are sleeping or disinterested in visitors, but these animals seemed to thrive on the attention of humans and loved to put on a show for us. We had so much fun this day. These guys put on the real show. At first we thought it was a male and female doing a little, well, you know. But later we found out that they were both males and they do this all the time because one is always trying to dominate the other. I wonder if they got a couple of ladies in the sand pit, how the dominating factor would change? The elephant pen was so fun because they had a pond where you could watch the animals bathe, and also another feeding station similar to the one the giraffes had, where you could climb up top and get really close to these sweet creatures. My favorite animals I love to see at any zoo is the big cat. Every time I see one, I find it hard to believe they are ferocious. They always seem so cute and cuddly to me, like I could just walk right up to one and give them a big hug and tickle them behind the ears. Oh well, maybe not on this earth, but someday we will be able to play with the big kitties and not get hurt! Ah, the King of the Jungle! And he acted like a king on our visit, letting out some magnificent, powerful roars. We really got a kick out of hearing him roar. He also had to prove his dominance on during our visit, but this one had a lady partner in his pen. 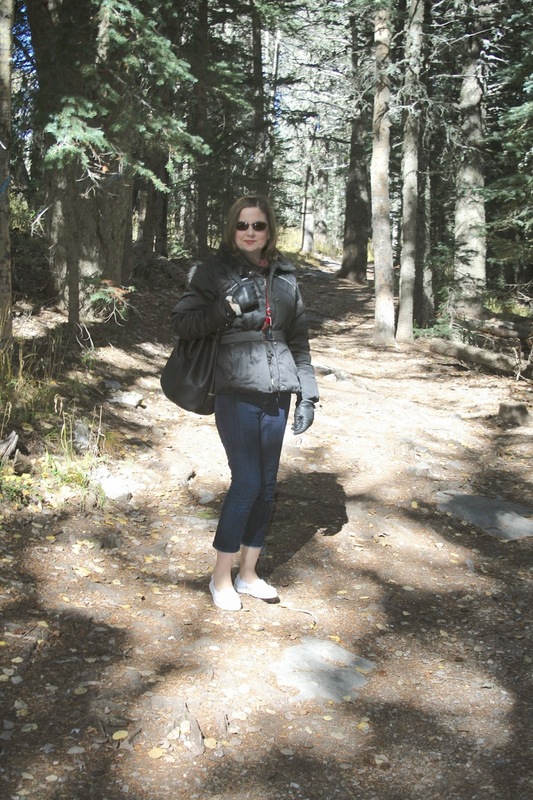 Because I was hiking in the Sandia Mountains earlier this day I was dressed in layers. The temperatures changed from the 40's up in the mountains, to almost 80 degrees at the zoo in the middle of the day. I was wearing a winter coat in the morning, and was down to a t-shirt and tank top later in the day. Quite the extremes in temperatures. 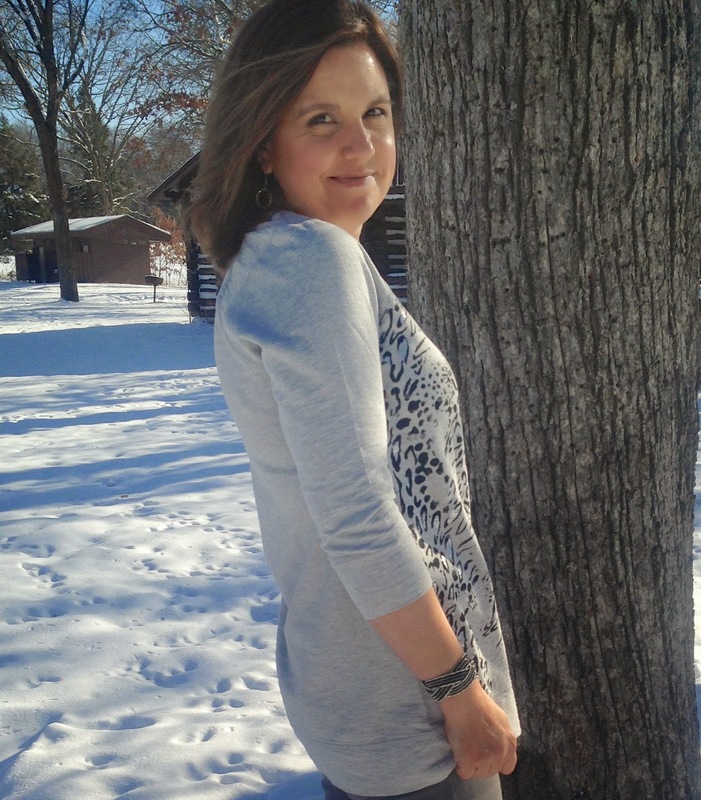 My striped shirt I received from Stitch Fix this past summer. Look at this beautiful guy! He was certainly enjoying the New Mexico sunshine on our visit. Don't you just want to climb up on his back and wrap your arms around his neck and give him a big hug? He looks so cute and cuddly! I love that fur! The painted ducks were so beautiful. Just look at all the detail and color in these creatures. They almost don't seem real they are so perfect. What a designer our God is! Who is more than creative than He? Are you beginning to doubt the existence of God because your plagued with the worries of this life? Just go and visit a zoo. You will see His amazing handiwork everywhere, and you will uplifted. I know I was! We arrived to see the ducks at just the perfect timing. A zoo custodian was walking by the pond carrying a bucket. Every single duck came out of the water (there must have been hundreds!) because they saw her with the bucket and knew it was feeding time. What fun that was to see! Below is a picture of one of the many adobe styled buildings on the property. The spirit of New Mexico was definitely represented on the zoo grounds. Here's my little giraffe friend smiling for the camera. Isn't he a cutie? Don't you just love those ears? What an expression too! Well it was growing dark and starting to get cold by the time we finished our tour of the zoo. So sadly, we had to say goodbye to all our new animal friends, and meet our daughter for dinner. 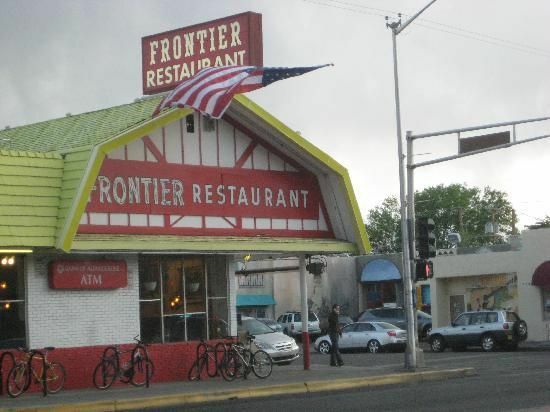 I wanted to try a famous, local diner I had read about called the Frontier Restaurant. It has been in Albuquerque for over 30 years and is located right across the street from the University of New Mexico. If you ever are in New Mexico, you must visit this restaurant. I absolutely loved this place. The food was delicious, with very generous portions and probably the lowest prices I've seen in twenty years anywhere. But what I loved most was the atmosphere. Because it is located across from the University in downtown Albuquerque it is filled with such a mix of people of all classes, incomes, ages, and races. During our visit, there were young college students and hipsters there, college professors, African Americans, Hispanic, elderly people, etc. And you know what? Every one was kind and respectful to each other and every one got along. Maybe that's what this world needs….more good, affordable restaurants that everyone can gather in and enjoy good food and company! As an example of humanity at it's best, as we leaving, an elderly couple wanted our table (it must have been 'their' favorite table, for they had a good view of the bus stop from there), but they overheard us talking about directions and they wanted to help. Then, we didn't know what to do with our dirty trays/dishes, and they said 'Oh, just leave them here. They'll come and pick them up.' My husband felt terrible leaving his dirty dishes in front of their faces, but they didn't mind. They were so sweet and helpful, just the complete opposite of the rudeness I experience everyday in the retail world I live in. It was so refreshing to see. The decor of the restaurant itself leaves much to be desired. 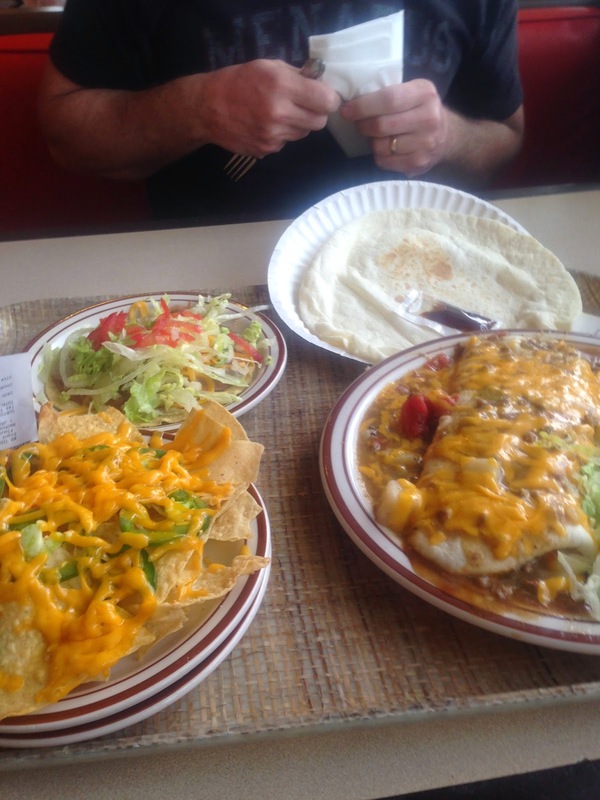 It is not fancy by any means, just your typical American diner, but, I liked it that way. I felt very at home and comfortable there. It was very nostalgic. I don't think they've redecorated it since they opened, and they apparently don't need to by the amount of business they do everyday. There were signs hanging from the ceiling in various spots through out the restaurant that read '10 minute wait from here' or '15 minute wait from here'. Thankfully, it wasn't that busy when we were there, but there was still a line. I don't think we paid more than $8.00 for all this food. They also had a pot of chili sitting on the counter, that anyone could just walk up to and put a spoonful of chili on their plate. We filled our extra tortilla with some. Everything was mouth watering delicious! The end of Day Five concluded with a brief stop at a Sonic (we don't have those in Wisconsin, so we always visit one when we travel to warmer states) for a malt, then we took Ashley back to the National Hispanic Cultural Center for yet another evening rehearsal for her opera. She gave us a brief tour of this beautiful facility and we were able to see some of Carlos Santa's guitars and other memorabilia displayed in the foyer. That was exciting! Well I hope you enjoyed hearing about our visit to the Albuquerque Zoo. What about you? Do you like to visit zoos? What American Zoo's are your favorites? Hello! I have a celebratory card to share with you today. I actually made this in the spring for a high school graduate, and I am just getting around to posting it now. 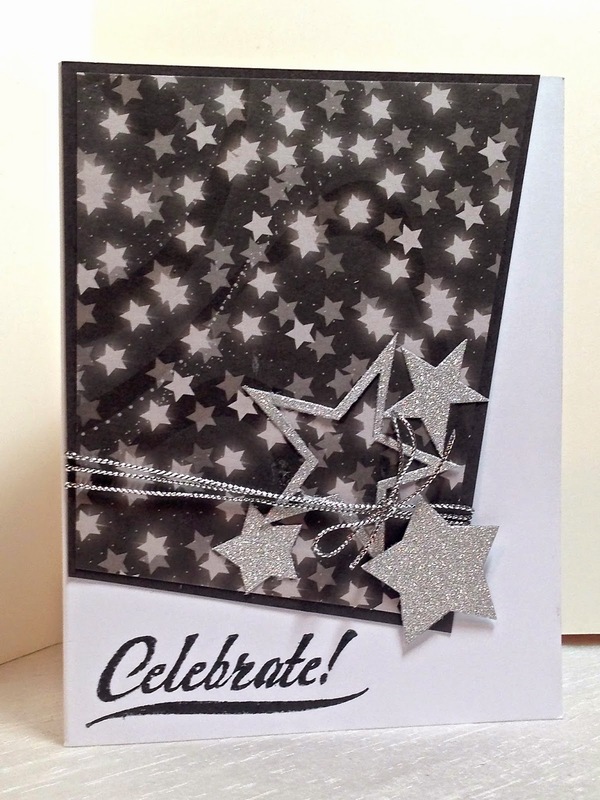 However, because it is a very generic celebratory card, you could use it for many other happy occasions like New Years, a job promotion, etc. The black paper is designer paper. 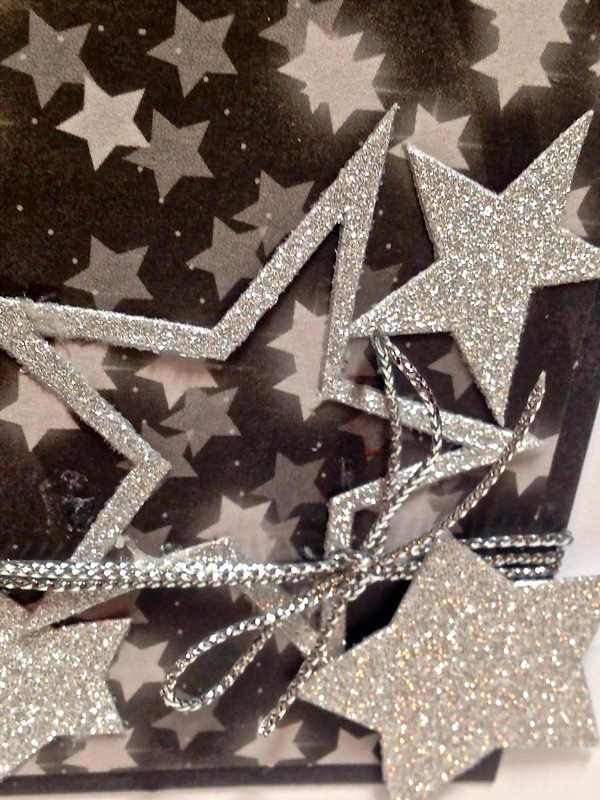 And the stars were cut out of glitter paper using a Cuttlebug Die. I wrapped silver string around the designer paper for embellishment. Hello! I'm back with another travel post of Our Road Trip Out West. 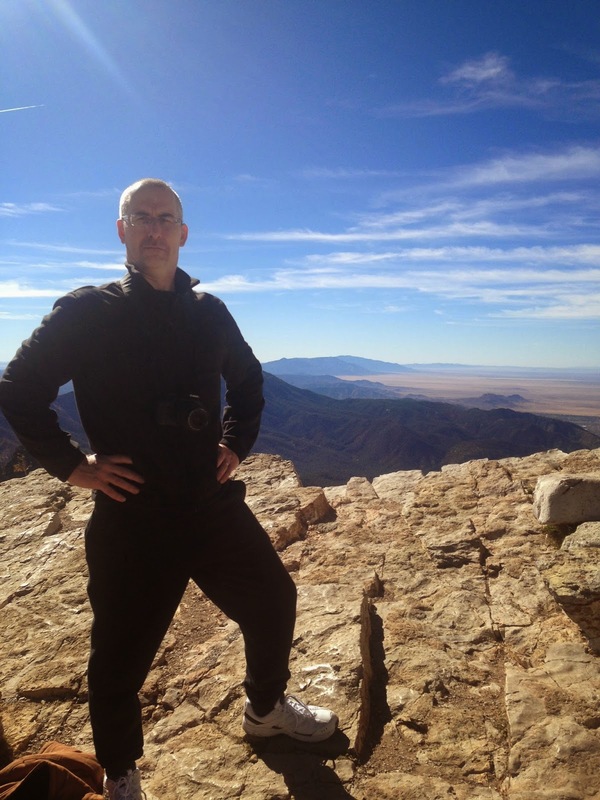 Today's post starts with the morning of Day Five, our trip up the Sandia Mountains. If you missed my other travel posts, just scroll down. On the morning of Day Five we woke up early in our Albuquerque hotel excited to take a tram ride up to the top of the Sandia Mountains. This was hands down my absolute favorite part of our trip. 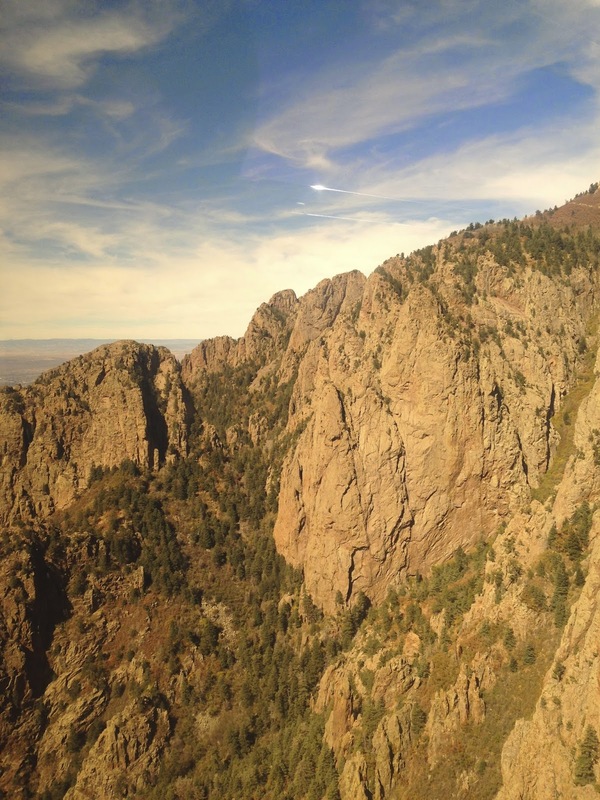 The Sandia Peak Tramway takes you on a 2.7 mile ride to the top of a mountain 10,378 feet above sea level. The views up are absolutely amazing as the tram can get so close to the magnificent rock formations. Now for those of you who have been faithful readers of my blog for years are probably wondering how did I handle my fear of heights? I was not afraid one bit on this ride, and I felt very safe and secure. I've learned when it comes to my fear of heights it's all about open space vs. closed space for me. I'm not afraid to fly in an airplane, or go up to the top of the Willis Tower in Chicago. If the space is enclosed, I feel just fine. When the space is open: such as the side of a cliff (more on that later), a balcony, or open staircases, that's when I start to freak out a little. The tram ascends up about 4000 feet in about 15 minutes, with views of 11,000 square miles once up at the top. The tram has large glass windows from the waist up, so you can see these gorgeous views. I advise getting there very early in the morning however, because they can pack people in like sardines and you won't get a window seat like we did if you take a later tram. We had unobstructed views on our way up and down, which was wonderful! As you can tell from our yawning tour guide, it was the first tram of the day. I had to chuckle at this guy at how horrible of a tour guide he was. I swear he took a big yawn every thirty seconds. I'm sure he's been up and down this mountain a billion times and is bored to tears about it, but he should at least show some excitement considering for most people it was their first time. He told all about the history of the tram, it's construction, the distances you see, the heights you climb, and everything you need to know about the geology of the mountains and surrounding areas. He just needed to be a little more entertaining. I told my husband later, I would love to switch jobs with him and ride up and down this mountain everyday, seeing these gorgeous views instead of what I have to do for a living now. Talk about a dream job! As you can see, there was hardly anyone in our tram. It is capable of holding 50 passengers, and I think there were only six in our car. 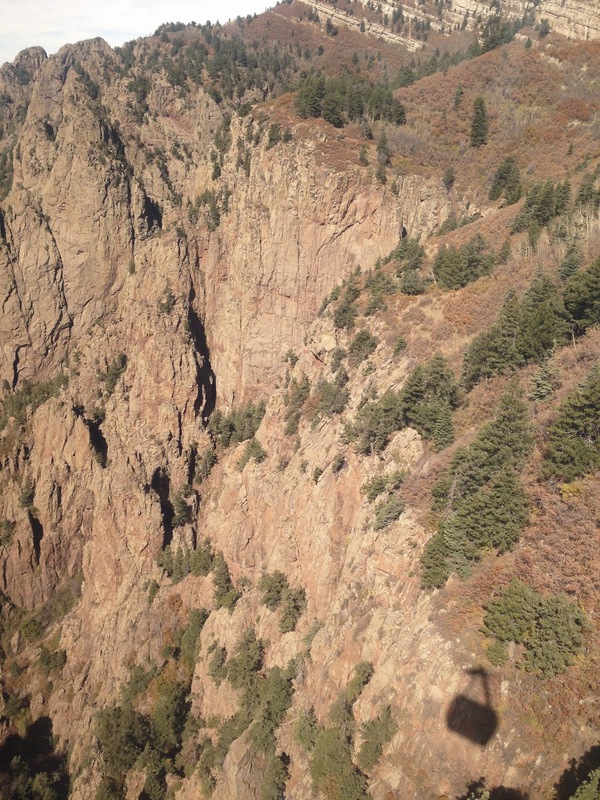 Just look at these views: I fell in love with the terrain of New Mexico on this vacation. I don't know what it was about this magical landscape: was it because I had never seen terrain like this before in my life, or was it the color of the landscape and the endless blue skies unblocked by trees or human habitation? I don't know, I just loved it. When you get off the tram there are multiple observation decks with panoramic views of the Sandia Mountain Range. In this picture, I was nervous. Of course the deck has a railing and it is stable, but it's very windy on the top of a mountain, and the deck overhangs the cliff, so I was uncomfortable in my surroundings and only stayed long enough for a quick peak and picture. If your wondering why I have a winter coat on, it's because it's 20 to 30 degrees colder at the top of the mountain than it is below. It was in the sixties before we got on the tram, and 15 minutes later, we were in need of our winter coats. We were well prepared this time after our North Carolina and New Hampshire mountain adventures, where we had no idea of the extreme temperature changes and FROZE, so we had the foresight to bring our winter coats with us to New Mexico! Another view from one of the observation decks. Here is another observation deck and also a ski lift. Yes, they do ski in New Mexico. Here's a picture of my hubby and I that a friendly tourist offered to take of the two of us. I love it when people offer to take our picture. So often our vacation pictures are solo shots, and it's so nice when someone offers to take a couple shot for us. The cost of the tram is $20.00 for an adult ticket, less for children, teens, and seniors citizens. I thought that was such a reasonable and affordable cost for such an amazing attraction. My favorite part about the tram (other than the views) was that there was no time limit for how long you stayed at the top. You just had to be sure to be on the last tram for the day (if you wanted a ride down) or you would be spending the night up there or hiking down! 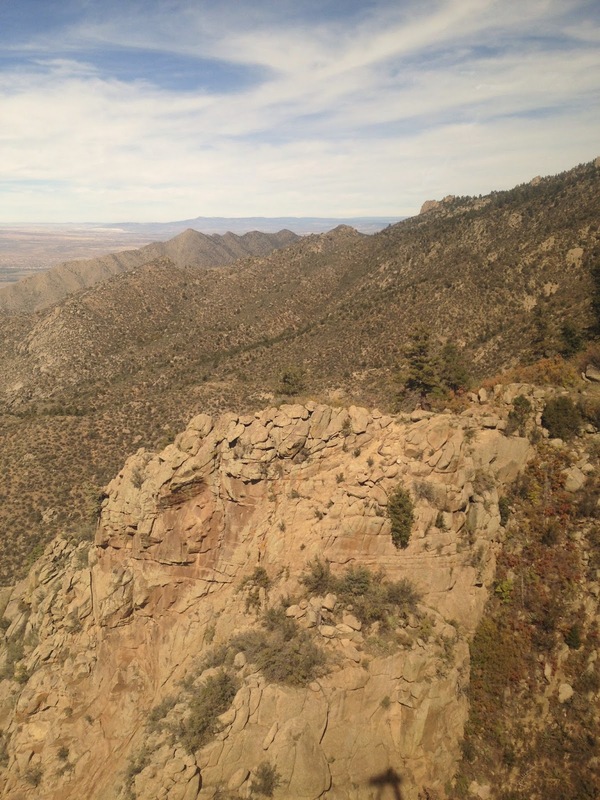 The Sandia Mountain range is largely within the Cibola National Forest and is protected as the Sandia Mountain Forest. It is home to mule deer, black bears, cougars, and other small forest animals. There are multiple hiking trails you can enjoy in this forest. We started out taking a trail that was on the edge of the mountain. The views were spectacular, as you can imagine any view would be when your standing on the edge of a cliff, but we didn't go far on this trail because I was such a nervous wreck that I or my husband would lose our footing and plummet 4000 feet to our deaths. This trail also started to descend the mountain because we were already at the top, and we knew if we didn't turn around at some point, we'd either have to hike the rest of the way down, or hike back up to catch the tram. My husband made me sit on this rock to capture this view. Where you see the end of the rock behind me is a steep drop off the mountain side. This was as close as I would get to the edge. I will say that the trails in this forest were very well maintained and well marked. I was not nervous at all about getting lost in the forest, unlike our New Hampshire hiking adventures of last summer. The only thing I was nervous about was running across a bear or large cat. But the only animal life we encountered was a fox, some very friendly squirrels, and lots of birds. I recognized the bird calls of the finches, because we use to have finches as pets in our home. They make a 'beep, beep' sound. We don't have them in Wisconsin, so I never heard them in mass in the wild before. It was quite interesting. What we really loved about this mountain range was all the beautiful trees of the forest: the hardy pines, aspens, oak, fir, and spruce trees. Most mountain summits don't have a lot of trees because the climate is too severe for them to sustain life. In North Carolina when we were up in the Smokey Mountains, we saw a lot of trees that had no needles, they looked more like tree stumps than trees. We were told it was because of damage done by acid rain. Then in New Hampshire, there were lots of trees until you got to the top of the White Mountains, but then it was just solid rock and no life whatsoever because the winds were so strong and the temperatures were bitter cold. The Sandia Mountains do not get quite as cold because it is a warmer state and the elevation isn't quite as high because the entire state's altitude is higher than it's eastern counterparts. In the picture below there is a very tiny stone structure built on the very tip of this mountain. Do you see it? It's on the top edge, right in the middle? We saw this house on the tram ride up so my husband wanted to hike to it and take a closer look. It is called The Kiwanis Cabin and is built on a slanted slab of nearly bare rock. It was built by the Civilian Conservation Corps in 1936. The trail is to the cabin is about a mile and a half and you walk mostly on a level path through beautiful shaded forests to get there. We loved to just walk quietly and listen to the sounds of the forest such as the beep-beeps of the finches, and the scampering of squirrels through the leaves. The squirrels seemed extremely friendly, and even ran right across my path. I had the feeling they were use to being fed by tourists as there is a dining establishment on top of mountain with both indoor and outdoor seating. Here's a picture of me walking on the hiking trail. This is my old winter coat by the way. The one I told you I wanted to replace with my new one in THIS POST because it was too short and didn't keep my legs warm. After walking through the forest, you eventually come to a sunny meadow where mule deer are often spotted. Unfortunately, we didn't see any on the day of our visit. We were so excited we finally reached our destination: it seemed like a long walk and although we would have loved to have spent the entire day up on the mountain exploring all the trails, we were scheduled to meet our son-in-law in Albuquerque in the afternoon, so we only had the morning to explore. The picture above is the outside of the structure. You can go inside and look out the windows. This is my husband standing proudly outside the cabin. The views from this spot are spectacular! After a brief stay at the cabin, we knew we running out of time for our afternoon appointment, so we hiked quickly back to the tram and began the descent down the mountain. Again, we were blessed with gorgeous mountain views and we loved how close the tram came to the rock formations. Do you see the shadow of the tram in the picture below? The shadow really helps give perspective of the size of these mountains. 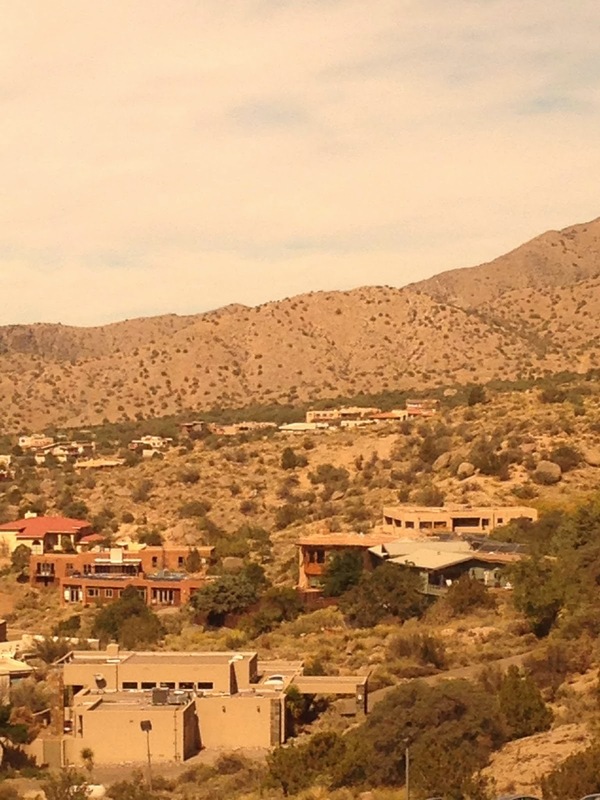 At the base of the mountains, near the tram station, are these adobe style homes. I told my husband I would love to live here. What a view these home owners have! My only fear would be rock slides. We have that problem here in the bluffs of Buffalo County, and entire homes have been crushed by falling rock. And that concludes the morning of our fifth day of vacation. 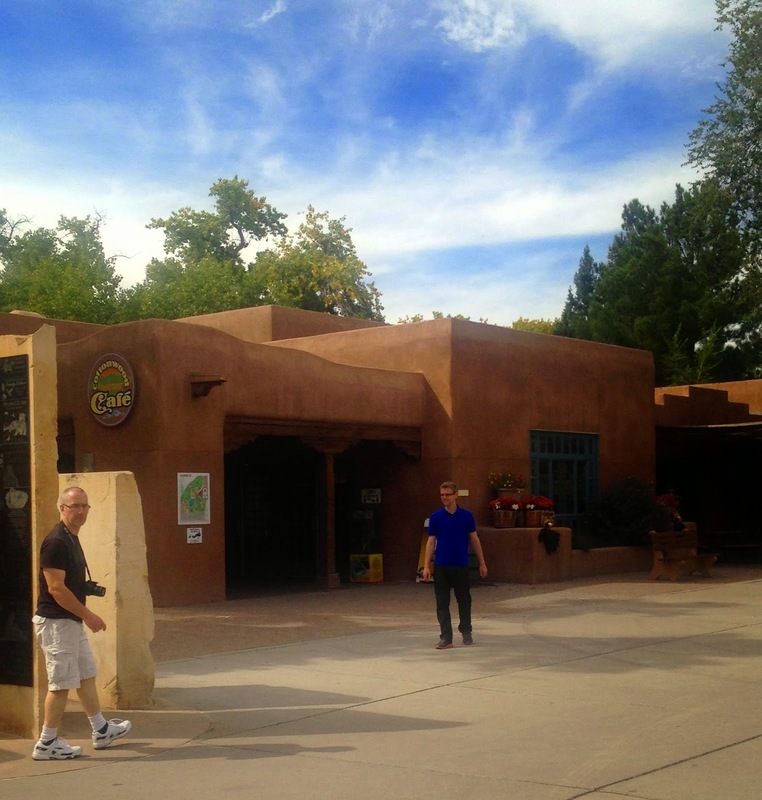 Next week's travel post will be about our afternoon visit to the Albuquerque Zoo and a historic restaurant in downtown Albuquerque.